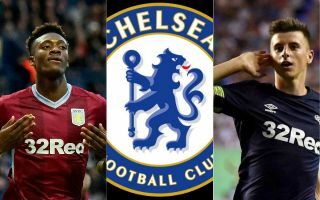 Chelsea face a potentially nightmarish summer in the transfer market – with Eden Hazard’s potential departure perhaps only the least of their worries. Andreas Christensen has been quoted by Sport Witness as suggesting the Blues already know they won’t be successful with their appeal and will therefore not be looking to sell players this summer. Still, it looks increasingly difficult for Chelsea to keep Hazard as he nears the end of his contract, with Diario Gol among the sources saying the Belgium international does have his price as Real Madrid show a strong interest. One of the best young players in Europe at the moment, it’s criminal that Callum Hudson-Odoi hasn’t already been given more of a key role in Maurizio Sarri’s side. The England international could be ideal to ensure Chelsea don’t miss Hazard without needing to spend a penny – just make sure to reject any bids that come in from him and give him a new contract! Another undervalued young player at Chelsea, Ruben Loftus-Cheek surely needs to be made automatic first choice in the Blues’ midfield next season. Marca claim the future of loan signing Mateo Kovacic is up in the air due to the possible CFC transfer ban, but Loftus-Cheek is arguably better anyway. Let the Croatian go back to Real Madrid and make build around this guy. Another hugely promising talent coming through at the Bridge, Ethan Ampadu needs to be given far more playing time soon, especially as Jorginho has hardly been that convincing in central midfield. And yet the Italy international has been near-undroppable in the eyes of Sarri. Ampadu needs to be shown more faith next season, at the very least to just keep Jorginho on his toes. Not long ago seen as one of the best young defenders in Europe, Andreas Christensen’s career is now stalling at Chelsea. With David Luiz nearing the end of his contract and Gary Cahill now seemingly out of the first-team picture, Christensen needs to be made first choice next season as it’s unlikely the club could find anyone quite that good for a reasonable price even if they weren’t banned from signing players.